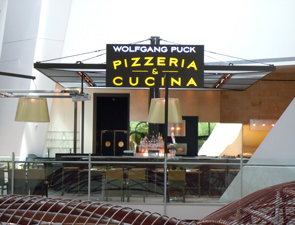 Can't get enough of Wolfgang Puck's famous pizzas? 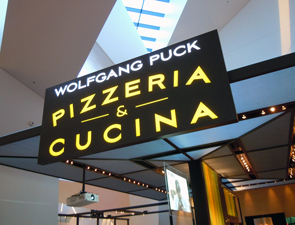 Now you can get one in a truly elegant setting at Wolfgang Puck Pizzeria & Cucina at Crystals, the luxury retail, restaurant and entertainment center at CityCenter, Las Vegas' newest mega development. A tribute to the culinary world's "liquid gold," the restaurant is decked out in olive and olive oil motifs, which are proof of the attention to detail that's been paid throughout, not only to design, but also to cuisine. From the visible pizza oven and the demonstration kitchen to the olive grove glass wall and the elegant lighting, the restaurant's visual impact is stunning. And so is the service, which is seamless thanks to the helpful and knowledgeable staff. So, when you're craving a quick pizza and a leisurely contemporary dining experience, rest assured: Puck's got the place.